This 1 day Emergency First Aid at Work training course makes anyone who completes it a formally qualified emergency first aider. 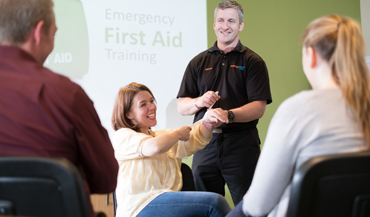 If your first aid 'needs assessment' stipulates that you need a qualified first aider in the work place, then this course provides all of the training required along with a recognised certificate which is valid for 3 years. The course meets all the guidelines and the resulting qualification is recognised by the HSE. Alongside meeting these obligations, you will also be equipped with the knowledge, skills and confidence to handle a wide range of emergency situations, from minor injuries to life-threatening conditions. With the Emergency First Aid at Work course from Training Plus, you will be able to administer the right treatment swiftly and decisively during a crucial emergency moment where every second counts! There will be a short written and practical assessment at the end of the Emergency First Aid at Work training course. You will receive an Emergency First Aid at Work EFAW certificate valid for three years which is accredited by Highfield. Any personnel who require an emergency first aid at work (EFAW) certificate to comply with HSE Legislation. You do not need to bring any equipment to this Emergency First Aid at Work course. No formal qualifications or experience is necessary for the Emergency First Aid at Work training course. Do I need to pay for my Emergency First Aid At Work course before I do it? Certification lasts for three years. Although the HSE strongly recommends that first-aiders undertake annual refresher training, over half a day, during any three-year FAW/EFAW certification period. 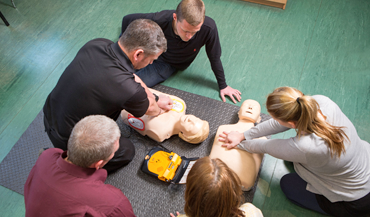 Although not mandatory, this will help qualified first-aiders keep up to date with any changes to first-aid procedures and maintain their basic skills. If I attend an Emergency First Aid at Work Course, what does this mean? Successful candidates will receive a certificate which allows them to practice as a First Aider for three years after which a re-qualification course will become necessary. The HSE strongly recommend that first aid skills are updated by taking a refresher course yearly. What is the difference between FAW and EFAW? FAW (First Aid at Work) does include EFAW (Emergency First Aid at Work) training and also instructs the first-aider to apply first aid to a range of illness and specific injuries. This is a minimum of 18 hours over three days. The type of course required is dependent on risk. EFAW training enables a first-aider to give emergency first aid to someone who either becomes ill or is injured whilst at work. This is a one day course.